One of the most convenient Windows alternative menus! Start Menu 10 Pro was available as a giveaway on March 12, 2016! How would you improve Start Menu 10 Pro? Start Menu X is a replacement of the system menu for professionals. Power users know how inconvenient and time-consuming it is to launch programs from the system menu. There is a solution for you! Pretty sure I tried a few different replacement menus back in the XP/Vsta days,. Skimmed the comments and am surprised (or missed it) to not see any mention of Iobit's free Start Menu 8 which is what I currently use on both my Windows 10 updated devices, which works for me, does what I want it to and which I;m happty with. I have Smart Menu 8. Should I uninstall it before installing 10? @ John King: To answer your comment, you are correct in stating that Ordinary Software makes both programs, the difference is in the interface of each application. Start Menu X was originally developed for Windows 7, and the Start Menu it creates allows you to see all programs on a single screen, or the Control Panel showing on one page, or for Win 10 users, all the installed apps on a single page. One click, 3 all-in-one screen displays, showing 3 different all-in-one alphabetized screens. Start Menu 10 was created to mimic the Windows 10 GUI. So when that start menu opens it mimics the Windows 10 interface by opening a window that you can then select what you want to view - Jump Lists, files, audio/video links, etc. .
As I prefer to see all my programs on a single screen, I'm staying with Start Menu X, even though I run Windows 10 on all of my 4 computers - 3 paid Pro versions, and 1 freebie on my play computer. What is the difference between SMART MENU 10 PRO and SMART MENU X ?!? "Start Menu X is a replacement of the system menu for professionals. Power users know how inconvenient and time-consuming it is to launch programs from the system menu." This was in the Featured Titles section. Apparently, X is for professionals and 10 is for regular users. <b>dan</b> "Start Menu X is a replacement of the system menu for professionals. Power users know how inconvenient and time-consuming it is to launch programs from the system menu." This was in the Featured Titles section. Apparently, X is for professionals and 10 is for regular users. So what is 10 Pro? There is an X Pro too? What is Pro about these offerings? I am an IT pro (senior systems analyst) and never find anything particularly 'professional' about the Pro additions. <b>Morris Cox</b> So what is 10 Pro? There is an X Pro too? What is Pro about these offerings? I am an IT pro (senior systems analyst) and never find anything particularly 'professional' about the Pro additions. Sorry, I thought I replied earlier but it didn't get posted. I've been using the "X" version for 6 months or so and like it, so I'll just let sleeping dogs lie. Finalbird does not work on "all Windows". It requires Windows 7 and above. <b>Frank J</b> Finalbird does not work on "all Windows". It requires Windows 7 and above. You have latest 5.80 version. Thank you! I've been using Startmenu X on my Win7 machine for years, and find it to be an extremely useful tool, so much so that when I sit down at a machine without it, it takes me a minute to reorient to Microsoft's sparse built-in offering. Just a much easier way to locate everything on a machine. If I had Windows 10, this would be one of the first things I installed. I've been using Startmenu X on my Win7 machine for years, and find it to be an extremely useful tool, so much so that when I sit down at a machine without it, it takes me a minute to reorient to Microsoft's sparse built-in offering. Just a much easier way to locate everything on a machine. If I had Windows 10, this would be one of the first things I installed. was running free version StartMenuX - unzipped this offering on my W10Pro x64 main system, ran it, and it immediately reported it was activated, but there was no sign of it having been installed on the system. I uninstalled the old version and tried again with the same result. Tried the same on my x64 W10 Pro laptop and it DID install OK.
was running free version StartMenuX - unzipped this offering on my W10Pro x64 main system, ran it, and it immediately reported it was activated, but there was no sign of it having been installed on the system. I uninstalled the old version and tried again with the same result. Tried the same on my x64 W10 Pro laptop and it DID install OK.
Alas ... I still use Pinnacle Studio 18 Ultimate which as established at last Giveaway (still) seems to prevent this program from functioning. John, Yes, they are made by the same folk. 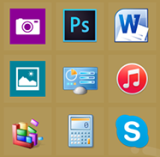 Start Menu 10 is a variation of Start Menu X, with the big icons of your most commonly used programs at the top of the menu, rather than on the left side, as far as I can see. It's definitely more touch screen oriented. Nice program but found the inability to remove items for the Most Recently Used Apps to be a deal breaker. Would buy the program now if there was a method to delete selected items on that listing. Reason for this is to remove recently used items from the view of other users on this PC. Nice program but found the inability to remove items for the Most Recently Used Apps to be a deal breaker. Would buy the program now if there was a method to delete selected items on that listing. Reason for this is to remove recently used items from the view of other users on this PC. I have tried both startmenu X and startmenu 10 by Ordinarysoft. While both are better than the basic windows start menu by a country mile, I prefer startmenu X. I just prefer my start menu to be straight forward and simple but with a few extra bells and whistles. Startmenu X is great. Just my two cents. Yes, start menu X is brilliant and a keeper. <b>Peaches</b> Yes, start menu X is brilliant and a keeper. Can you switch between Startmenu 10 and WIN 10 menu setups at will? <b>Peaches</b> Can you switch between Startmenu 10 and WIN 10 menu setups at will? If so, how? Thanks. Did not work for me, downloaded, unzipped into new folder and ran. Still have the win 10 start menu, clicking on the start produces the old menu, holding shift and then clicking start does the same thing. Did not work for me, downloaded, unzipped into new folder and ran. Windows 10 x64. Still have the win 10 start menu, clicking on the start produces the old menu, holding shift and then clicking start does the same thing. Does anyone know if this needs to be registered? It didn't ask for it, nor can I find anywhere to. Plus couldn't find a way to get a registration key. Doesn't say in the read me either. I don't want to just assume this is the pro version, and then somehow it needs registered and my time runs out. Looks to be a pretty interesting program from the looks of it. Ihaven't gotten into it yet. Does anyone know if this needs to be registered? It didn't ask for it, nor can I find anywhere to. Plus couldn't find a way to get a registration key. Doesn't say in the read me either. I don't want to just assume this is the pro version, and then somehow it needs registered and my time runs out. Looks to be a pretty interesting program from the looks of it. Ihaven't gotten into it yet. There is no need to activated/register the software of today. For me the best way to bring back the old familiar Start button and Start menu on Windows 8-10 is Classic Shell, which by the way is completely free. Have to agree with this poster. Used Classic Shell on my Windows 10 64 Bit Home Edition laptop and it now has the old XP style look and feel. Totally free. Now perhaps Start Menu Pro has some extra features, but since my computer is already doing what I want, how I want it, why try to change it and maybe mess everything up again. <b>H. Wijk</b> Have to agree with this poster. Used Classic Shell on my Windows 10 64 Bit Home Edition laptop and it now has the old XP style look and feel. Totally free. Now perhaps Start Menu Pro has some extra features, but since my computer is already doing what I want, how I want it, why try to change it and maybe mess everything up again. I'm new to Windows 10. Can you tell me how to find the Classic Shell? <b>Bruce</b> I'm new to Windows 10. Can you tell me how to find the Classic Shell? Woody Leonhard's various articles on Win 10 -- several of them very cautionary, btw -- are an absolute must-read ! <b>lisa</b> According to what I found here https://en.wikipedia.org/wiki/Classic_Shell#Classic_Start_Menu Classic Start became one component of the more wide-ranging Classic Shell suite -- although the former can still be found separately. ( http://www.classicstartmenu.com/ ) [At least, I hope I've gotten that right ! ] You may also want to check out this comparisons piece: http://www.infoworld.com/article/2972763/microsoft-windows/windows-10-start-menus-start10-vs-classic-shell.html Woody Leonhard's various articles on Win 10 -- several of them very cautionary, btw -- are an absolute must-read ! Classic Shell comprises Classic Start Menu and Classic Explorer, in a single free installer package. It's the "Classic Start Menu" that is relevant to today's discussion about replacing the Windows 8/10 start menu. The "Classic Explorer" part of the package adds extra features/capabilities to File Explorer [which before Windows 8 was called Windows Explorer (not to be confused with Internet Explorer)]. <b>Lisa</b> Classic Shell comprises Classic Start Menu and Classic Explorer, in a single free installer package. It's the "Classic Start Menu" that is relevant to today's discussion about replacing the Windows 8/10 start menu. The "Classic Explorer" part of the package adds extra features/capabilities to File Explorer [which before Windows 8 was called Windows Explorer (not to be confused with Internet Explorer)]. Start Menu X is much better than Classic Shell. Also free. <b>Mike H</b> Start Menu X is much better than Classic Shell. Also free. Hey thankx for this information. It was in the back of my mind that there were alternatives but I couldn't remember the involved. <b>Gene</b> Hey thankx for this information. It was in the back of my mind that there were alternatives but I couldn't remember the involved. The URL you give for Classic Start Menu is NOT the start menu component of the Freeware Classic Shell, but is a comericial Start menu replacement by the same publisher as todays giveaway ordinarysoft, look at your URLs webpage footer and the Buy Now links on the page. <b>Gene</b> The URL you give for Classic Start Menu is NOT the start menu component of the Freeware Classic Shell, but is a comericial Start menu replacement by the same publisher as todays giveaway ordinarysoft, look at your URLs webpage footer and the Buy Now links on the page. <b>TK</b> Thanks for the correction. I downloaded, unzipped and nothing happened. How do I install the program? Sounds like you are a first timer. Usually you go to the unzipped folder and double click the readme file and read it. <b>Ray</b> Sounds like you are a first timer. Usually you go to the unzipped folder and double click the readme file and read it. I've been using this software program for years! And yes I'm old, it's still programs, not Apps to me. I can't say enough about how good Start Menu is. Started years ago with the free version on Windows 2000. Moved over to the Pro when it came up on GOTD. If you miss out on this giveaway, try the free version, its great too. Thanks to both Ordinary Soft and GOTD for todays offer. BTW. I read a interesting article on Start Menu 10 Pro website about Windows 10 Epic Fail, you may find it interesting also. There are four: X, X Pro, 10, 10 Pro. I would stick with X. <b>paul</b> There are four: X, X Pro, 10, 10 Pro. I would stick with X.
I bought this a while back after trying it out on GOTD, I find it very useful. A tip I would like to mention for those who are new to this, is that when you have it installed, you can flip between the Start Menu Pro and the original, by simply holding down the shift key as you click on the start button, (I am using it on Windows 7, I assume other OS will be the same). I found it is well worth the trouble to create the sub menus with program groups, (all music progs in one, office progs in another etc. ), as per the help directions, very easy once you get going. For a PC with lots of useless programs installed it is a must! I bought this a while back after trying it out on GOTD, I find it very useful. A tip I would like to mention for those who are new to this, is that when you have it installed, you can flip between the Start Menu Pro and the original, by simply holding down the shift key as you click on the start button, (I am using it on Windows 7, I assume other OS will be the same). I found it is well worth the trouble to create the sub menus with program groups, (all music progs in one, office progs in another etc. ), as per the help directions, very easy once you get going. For a PC with lots of useless programs installed it is a must! Thank you. I've been waiting for this to appear, having installed previous versions since moving over to Win 8 and now win 10. I've never got used to the win 8/10 start menu, much preferring the 'old' style start button with traditional explorer like menu. Thinking of purchasing the program while it is on offer so as to get the updates and the ability to install when i want to, especially after reinstalling windows, which I do a couple of times a year to get rid of all the rubbish I've accumulated. Bought this when I first came over to Win 10, and it's a great alternative to the regular system style. I've found it well worth the price. While it is decent, I still prefer the old school start menu on the older windows systems. Have you tried 'startisback'. Makes it pretty much like a Win7 start menu and reasonable at $2.99. I like it. <b>Levitiquetus</b> Have you tried 'startisback'. Makes it pretty much like a Win7 start menu and reasonable at $2.99. I like it.